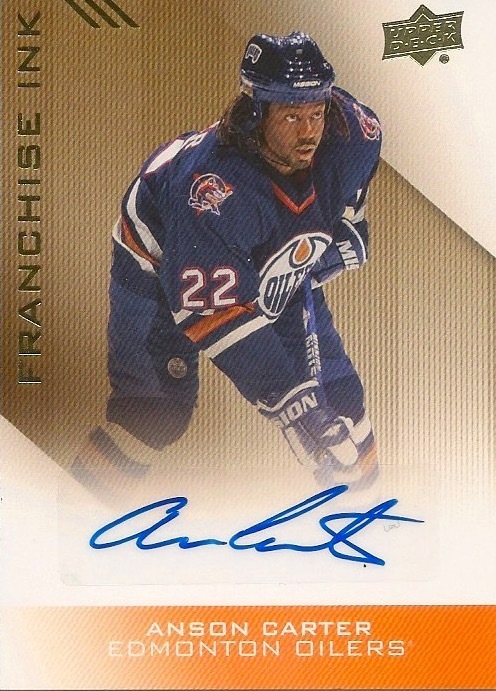 While compiling this list of Top 100 Oilers, I’ve been trying to think of a more complex character than Anson Carter, the soft-spoken winger who was much more than a damn good hockey player during the 211 games he played over parts of three seasons with Edmonton. I can’t come up with another name. Not one. Equal parts substance and style was Carter. Carter makes my list because of what he did on the ice, but there’s so much more to him. He defied the odds just to make it to the NHL after being drafted 220th overall in 1992. Carter’s work ethic was impeccable. His talent undeniable. Off the ice, his interests were many – he loved exotic cars and took great interest in the entertainment industry, fashion and hip-hop in particular. Carter was the best dressed player I’ve ever seen – no matter what anybody else wore, it looked like they were clad in potato sacks compared to Ace. Carter had it going on. And he could play. Raised in Toronto, history tells us that Carter was a longshot to have any kind of NHL career as a 10th-round draft pick when he finally hit the pros after four seasons with the Michigan State Spartans. Play he did, with his best years coming with the Oilers after being acquired in a November 2000 trade that sent popular and prolific Bill Guerin to the Boston Bruins (the trade also landed the Oilers a first-round pick that turned into Ales Hemsky). Carter had big skates to fill on the wing alongside Doug Weight and Ryan Smyth as the replacement for Guerin, who was big, tough and could skate like the wind. Guerin was also Weight’s best friend, so Carter had some convincing to do – not only with the Oiler captain, but with fans and inside the dressing room on a team that was up against the budget wall under the ownership of the EIG. Carter and Weight spent just one season as teammates before Edmonton’s best player was sent packing to St. Louis because the Oilers could no longer afford him. It was a good year, not a great one, as Carter produced 16-26-42 in 61 games. Carter wasn’t done. In 2001-02, Carter scored 28-32-60, tying him for the team scoring lead with 21-year-old Mike Comrie, his new centre. In 2002-03, Carter had 25-30-55 in 68 games before he was dealt to the New York Rangers with Ales Pisa for Radek Dvorak and Cory Cross. I always thought that Carter was a little bit underrated during his time in Edmonton. As a player, he was more subtle and silky smooth than Guerin, who wowed fans with flash, dash and bash, not to mention a sense of humour that endeared him to teammates and fans. Interestingly enough, Carter and Guerin would both play 211 games with the Oilers. Guerin produced 79-82-161, while Carter was right with him at 69-88-157. Down the hockey road, Carter made news with the Vancouver Canucks in 2005-06 after signing as an unrestricted free agent. He scored a career-high 33 goals while playing with Daniel and Henrik Sedin – they were dubbed the Brothers Line. It seemed like a perfect fit for Carter, but rather than return to Vancouver, he turned down a one-year, $1.7 million contract and ended his NHL career with stops in Columbus and Carolina. Released from a PTO in pre-season by the Oilers in 2007, Carter, who donned skates again for the Battle of the Blades with Shae-Lynn Bourne, is these days living in Atlanta. He started his own record label, Big Up Entertainment, has produced a couple of TV features, is co-founder of a clothing line, Shirt Off My Back, and has done hockey commentary for Fox Sports West and the NHL on NBC. Ace has still got it going on. Love that hip hip music. Dancin’ Anson – was I the only one who called him that? Always liked this player, and I think you’re right that he suffered a bit from being the return from the Guerin trade. Carter was night and day from Guerin in terms of style and personality. At the time the Oilers were more of a big, grinding team and I personally liked having a “soft skill” guy who got it done with speed and skill rather than crash and bang. Scored a gold medal winning OT goal for Canada -how many guys can say that?! As I remember he was pretty much the 14th forward for the 2002 Olympics. Had someone been injured, specifically a right shot forward he was slated to go. Might be wrong but that’s how I remember it. That was the World Championships – I want to say 2003. The Carter – Comrie – Smyth line had been gloriously reunited. The dreadnought right winger awesome player!He had finish around the net. My favourite memory of him is the entire arena shouting “Shoot it!”, he obliges, shot is blocked….”Shoot it again! !” The arena yells. Off topic but does anyone know what is happening with general fanager? I thought nation network aquired them. The guy that ran it got hired by an nhl team. I can’t remember which one Vegas? Cap friendly and nhlnumbers do the same thing tho. Capgeek was the biggest loss. Him and Mike Comrie were my favourite players when I was a kid. Too young to appreciate Dougie and Guerin at the time, was just getting to the age where I would remember players/numbers and would track them.